Seventy years have passed, yet as a society we still feel the tension between moral approval or disapproval on the one hand, and value-neutral scientific or psychological description on the other. Cowardice is a character flaw, a moral lapse, a weakness. PTSD, in contrast, is a syndrome that afflicts the virtuous and the vile alike. We similarly declare violent criminals evil — unless they are judged insane, in which case our moral condemnation suddenly feels misplaced. Likewise, a student who is lazy or careless needs to shape up to avoid our scorn; a student with ADHD, in contrast, is a victim, not a bad person. Personality descriptors — brave, cowardly, rebellious, compliant, curious, lazy, perceptive, criminal, and many more — feel incompatible with knowledge of our minds and brains. It seems the more we explain the roots of human behavior, the less we can pass moral judgment on it. It doesn’t matter if the explanation is biological (e.g., brain tumor, febrile delirium, seizure) or psychological (e.g., PTSD, childhood abuse, “raised that way”). However, perhaps because we feel we know our own minds best, it does seem to matter if we are accounting for ourselves versus others. We usually explain our own behavior in terms of value-neutral external contingencies — I’m late because I had a lot to do today, not because I’m unreliable — and more apt to tar others with a personality judgment such as “unreliable.” This finding, the Fundamental Attribution Error, has been a staple of social psychology research for decades. Will we eventually replace moral judgments of others with medical or psychological explanations that lack a blaming or praising tone? It appears our inclination to judge others will not pass quietly. Much of the rancor between the political Left and Right concerns the applicability of moral language. Are felons bad people, or merely raised the wrong way? Are the poor lazy and entitled, or trapped in poverty by circumstance? 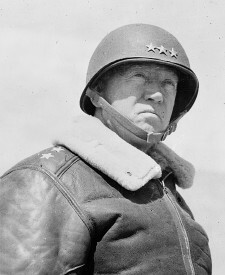 Was General Patton disciplining cowards who were shirking their duty, or was he verbally and physically abusing soldiers who had already been victimized? The Left and Right disagree over where to draw the line. But no matter how far we progress in our brain and behavioral sciences, we will still want to voice judgments of others — and negative judgments seem the more compelling. Humans are notoriously inventive in the use of language to denigrate. Originally neutral clinical terms like “idiot” and “moron” (and “retarded” and “deluded” and many more) eventually became terms of derision. Euphemisms like “juvenile delinquent” didn’t stay euphemistic for long. While it may blunt the sharpness of our scorn in the short term, “politically correct” language won’t change this aspect of human nature in any lasting way. Even logic doesn’t stop us. For example, terrorists are routinely called cowards in public discourse, although it isn’t clear why. Many terrorists voluntarily die in their efforts, an act considered heroic, or at least brave, in other contexts. They often attack civilian rather than military targets. But we did that in WWII, and we weren’t cowards. They use guile, sneak onto planes, employ distraction and misdirection — like our “cowardly” Special Forces do. The point is, we find terrorists despicable, but that isn’t a strong enough putdown. If we didn’t call them cowards, we’d have to call them something else to humiliate them. Mama’s boys? Humans are a funny species. Uniquely striving for intellectual understanding, yet not so far from the other beasts who purr or growl or screech their approval or protest. Balancing the aims of morality and science is the stuff of constant, and perhaps endless, political debate. Ultimately it’s irresolvable, yet we do our best to pay homage both to our hearts and our heads.